Figure 3-2. Component Location for Test Procedure, Type A Separator. Figure 3-1. Electronic Components and Test Point Locations for Type A Separators (Sheet 2 of 2). TM 55-2090-201-14&P 3-3. OPERATORS TROUBLESHOOTING PROCEDURES (Continued). 1. Control Panel 2. Auto Control Switch 3. 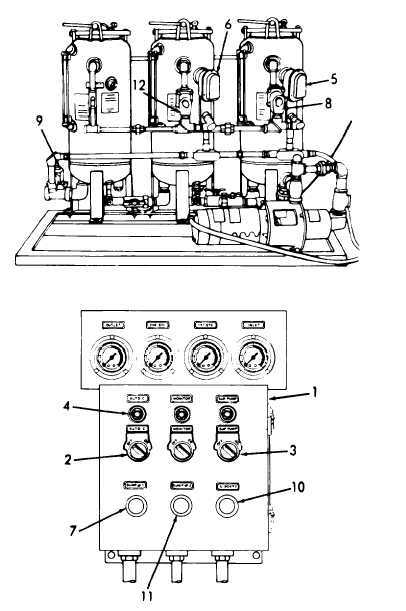 Supply Pump Switch 4. Auto Controls Indicator Light 5. First Stage (Prefilter) Mini-probe 6. Second Stage Mini-probe 7. First Stage Oil Dump Light Button Figure 3-2. Component Location for 3-28 8. First Stage Solenoid Operated Oil Discharge Valve 9. Solenoid Operated Water Dis- charge Valve 10. Overboard Discharge Light 11. No. 2 Oil Dump Light/Button 12. Second Stage Solenoid Operated Oil Discharge Valve Test Procedure, Type A Separator.